A system of classification of colours composed of about 1000 colour samples, each designated by a letter and number system. The letter and number of each sample indicate its hue, saturation (called chroma in this system) and brightness (called value). 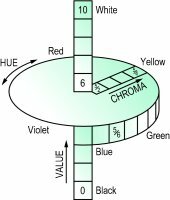 They are represented by a three-dimensional polar coordinate system in which the hue is represented along the circumference, the value along the vertical axis and the chroma along a radius (Fig. M14). See colorimetry; Farnsworth test. Munsell chroma and hue are plotted as polar coordinates, and a higher Munsell value is indicated by the greater size of the triangles (JAPAN 1970 and JAPAN 1987) or diamonds (USA 1975a and USA1975b). For the remaining soil samples the variation in Munsell notation as a result of using different soil-colour charts showed the following trends: (i) A reddening in hue using the Japanese charts; (ii) an increase in Munsell chroma and also a slight increase in Munsell value using JAPAN1970 charts; (iii) a better agreement between Munsell notations found with the 2 American charts than that found with the 2 Japanese charts. This overlap was caused mainly by the chips with Munsell value 2/or 1. Figures 3 and 4 show a comparison between measured and tabulated data for Munsell value and chroma in our soil-colour charts. In the old charts, the measured Munsell value was undervalued in the chips 5/, 6/, 7/, and 8/and overvalued in the chips noted with Munsell value 1.